In the recent flood of books about bullying, this one is a stand-out. Cheerleader, musician, top student, and pageant-winner Rawl has been HIV positive from birth. Telling her middle-school best friend set in motion a torrent of bigotry and abuse. Her mother was unfailingly supportive, but for a long time every adult who should have stepped up to help turned a deaf ear, or worse, to her plight. But Rawl, an extraordinary young woman, prevails. This excellent book should be required reading for all middle-school and high school students, parents, administrators, and counselors. An astonishing memoir for the untold number of children whose lives have been touched by bullying. Positive is a must-read for teens, their parents, educators, and administrators—a brave, visceral work that will save lives and resonate deeply. Paige Rawl has been HIV positive since birth, but growing up, she never felt like her illness defined her. On an unremarkable day in middle school, she disclosed to a friend her HIV-positive status—and within hours the bullying began. From that moment forward, every day was like walking through a minefield. Paige was never sure when or from where the next text, taunt, or hateful message would come. Then one night, desperate for escape, fifteen-year-old Paige found herself in her bathroom staring at a bottle of sleeping pills. That could have been the end of her story. Instead, it was only the beginning. 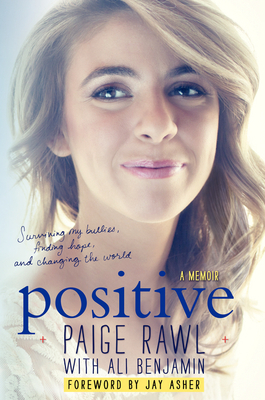 Paige's memoir calls for readers to choose action over complacency, compassion over cruelty—and above all, to be Positive. Includes twenty-five photos from Paige's personal collection throughout. Paige Rawl is an accomplished speaker and an inspirational figure for the tens of thousands of kids to whom she has spoken. Today, Paige is a national youth advocate, antibullying crusader, and powerful HIV/AIDS educator. Paige has been featured in multiple national media outlets, including USA Today, People magazine, Seventeen magazine, Nick News with Linda Ellerbee, the Huffington Post, and Poz magazine. Since Paige was eight years old, she has participated enthusiastically in pageants. Most recently, Paige was Miss Indiana Teen Essence 2011 and Miss Indiana High School America 2012. She is currently a student at Ball State University, where she plans to study molecular biology. Ali Benjamin's work has appeared in print, online, and on television. She lives with her family in rural Massachusetts.